SLIC Taillights, LLC & Emergency Vehicle Lighting, was started in Wheeling West Virginia with the purpose of creating an innovative emergency and public works product line. Working with industry leading engineers and manufacturers we created a superior and unique LED product line, after years of intensive research and development, SLIC Taillights, LLC & Emergency Vehicle Lighting is proud to launch these initial products into the industry. Stingerz® and MagicFlex® are completely flexible, waterproof, and extremely versatile. Stingerz® are the first flexible LED accent light to come pre-taped on all three sides, this allows the light to be mounted not only on the back surface but on either side surface providing an extremely flexible, versatile LED lighting solution. Stingerz® will work on any 10-14VDC. Stingerz® come in 6 precut sizes including 3 LED, 9 LED, 12 LED, 24 LED, 30 LED, and 99 LED's. Stingerz® are available in Red, Blue, White, Amber, Green, and Purple/UV. MagicFlex® are a surface mount LED light that only measures .25" wide X .10" thick. MagicFlex® come in 4 sizes 3 LED(1.5"), 6 LED(3"), 18 LED(9"), and 24 LED(12"). MagicFlex® are available in Red, Blue, White, Green, Purple/UV and Now Amber. SideStrikerz® are Side Profile LED lighting for Emergency vehicles. SideStrikerz® are 1/2" tall and 1/2" deep and come in 3 sizes 60" (150 LEDs), 47"(120 LEDs), and 38"(98 LEDs). Flame Stingerz® are available now. They come in 5 precut sizes including our Exclusive 4 LED (1.5") Flame Stingerz®. The other sizes include 12 LED, 24 LED, 36 LED and 60 LED. Flame Pods are available now. These Flame Pods were made for Valkyrie Velocity Stacks. Stingerz®, SideStrikerz®, and MagicFlex® carry a lifetime warranty against LED failure. The Sho Me Strobe Flasher carries a 5 year warranty. Feniex Industries Lighting carries a 5 year warranty on LED products and a 2 year warranty on sirens, speakers and controllers. Lifetime LED Lighting carries a lifetime warranty on all their LED products. All other products carry 2 year limited warranty. Just return the product and it will be repaired or replaced according to the warranty. 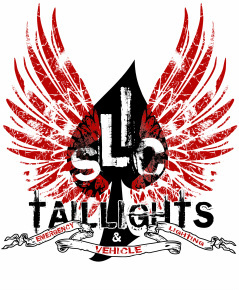 SLIC Taillights, LLC is 100% owned and operated by a Police Officer and an EMT - Basic. The owner uses all of these products on his own personal vehicle.